2015 has been a really exciting year for us at Packback. 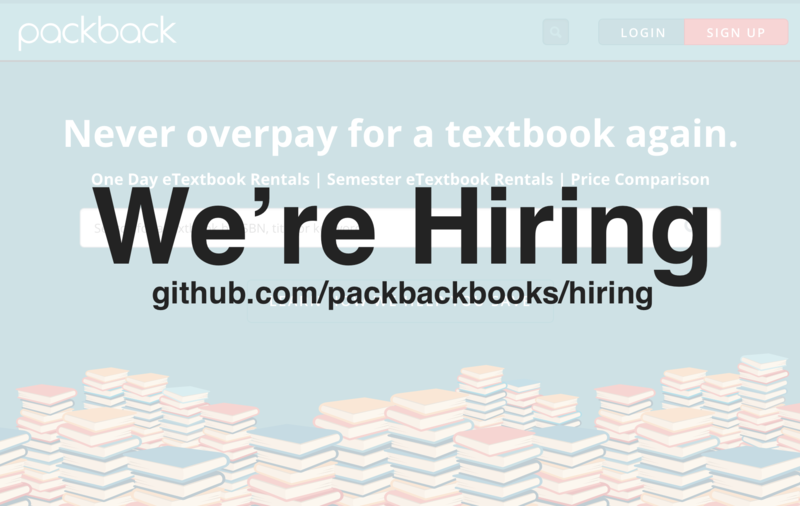 We released a complete rebuild of our eCommerce platform at Packbackbooks.com, we brought on our fourth full-time engineer, we started contributing to the open source community, we hired our first three full-time salespeople, we raised another $1.5 million, and now we’re even more excited to announce that we’re hiring again! As we’ve continued to grow, our need for a dedicated employee to take product designs and translate them into HTML and styling has grown as well. This role would start off as a part time contract role and possibly develop into a full time position as our need increases. Read more about this position and find out how to apply here. Scaling is a wonderful problem to have. Our developers have done a great job building software that can grow as Packback’s needs do, and now we’re ready to bring someone onto the team to help our servers grow too. Fortunately, we have a robust continuous integration process already in place, so you’re not coming in to inherit a terrible mess. Read about our continuous integration process at Packback. Read more about this position and find out how to apply here. Finally, we’re looking for a back end engineer (we work in PHP/Laravel) to join us and contribute to a brand new application that we’ll be launching in 2016. We have a great system in place for setting up microservices and building robust APIs, but we need someone who’s passionate about technology to help us get more improvements out faster. Check out a couple open source projects we’re working on: Packbot, Textbook Price Collector Read more about this position and find out how to apply here.